Social media has made it easier than ever before to connect with anyone interested in your products or services. And with geo-search, businesses can now monitor and reply to social messages in a specific region such as a city, a country, or a region. 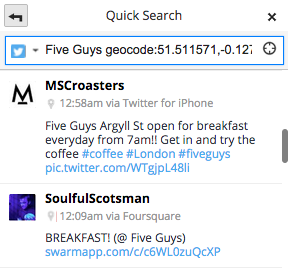 When burger franchise Five Guys started to expand out of the US and Canada into the UK market, they used the geo-search functionality available in Hootsuite to help spread the word about their new London location. By monitoring geo-tagged mentions of Five Guys within a certain radius of London, the company’s Online Marketing Specialist Kenneth Westling was able to identify and engage with a highly targeted, receptive group of people on social media. 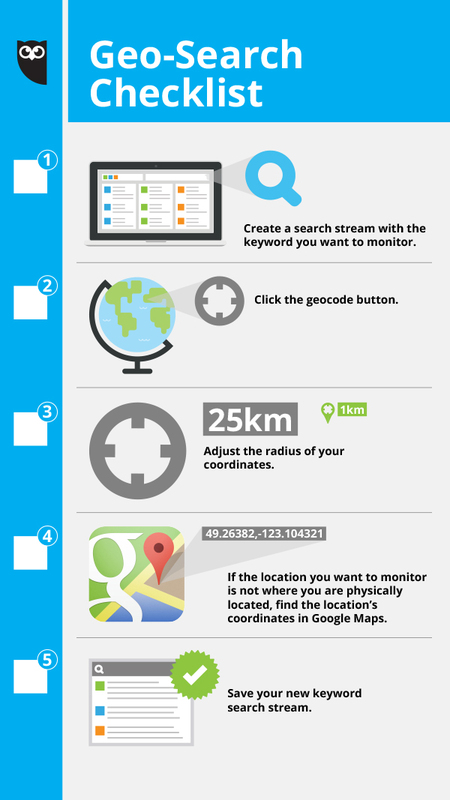 Here’s how you can create your own geo-search, Five-Guys style, with a checklist designed to help guide you through the steps of setting up, using, and analyzing geo-tagged data. 1. 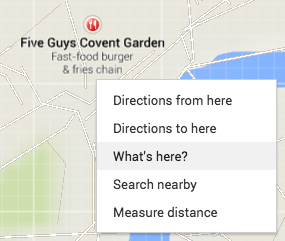 During their UK grand opening campaign, Five Guys used geo-search to reach out to local Londoners. To do so, they created a search stream with the keyword they wanted to monitor—”Five Guys”—and geocoded the stream for London, UK. Check out this Hootsuite Tip to learn how to create your own keyword search streams. 2. As you’re creating your keyword search stream, click on “search”, and then on the geocode button (which resembles a target). Once you do, Hootsuite will try to determine your location. You may see a popup asking you to allow Hootsuite to use your location. 3. Adjust the radius after the coordinates. Hint: You can change “km” to “mi” if you find it more intuitive. You can also explore creating several streams that use a different radius such as 5km, 25km, 100km, etc. The goal is to find content that is local, but not to use a radius so small that your “pool” is limited. Note: Only location-enabled Tweets will show in the stream. 4. If the location you want to monitor is where you are physically located, you’re done! If not, find the latitude and longitude of the location you want to monitor using Google Maps. This can be done by right clicking on the location you want to target and clicking “What’s here”. Copy and paste the coordinates into the geocode box in Hootsuite. 5. Be sure to save your search stream, which will show up as <<keyword>> geocode in your Hootsuite dashboard. And just like Five Guys, you’re now ready to use geo-targeting to truly tailor your content for better engagement and reach. 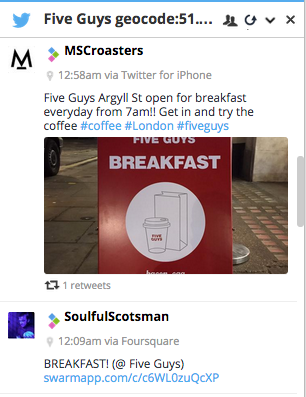 The search functionality available in the Hootsuite dashboard helped Five Guys hone in on Twitter conversations surrounding their brand in the UK—and as they continue to expand, it will help them reach the right audience near each of their international locations. To start benefiting from geo-searching, sign up for Hootsuite!